We lost Rumor entirely too soon to cancer. You always hear people talk about their once in a lifetime dog? Well Rumor truly was! His temperament was second to none. He was the epitome of a showman. He has produced 15 Champions to date. His color of red was so gorgeous it was hard to describe. A luscious Irish Setter mahogany. 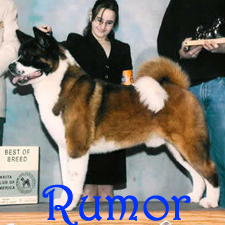 He has stamped his type on the Akita World.